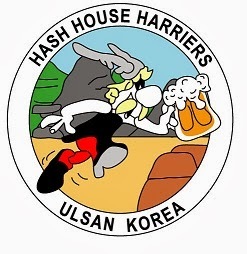 The 725th Ulsan Hash leaves from outside Seobu Foreigner’s Compound clubhouse at 11.00 AM on Sunday 31 Jan 2016. The Hash trails will be set by the Hare(s) “Peeping Tom & Dominic Munden" - Peeping Tom's final fling as Hare!. Food will be provided by “Big Ben”.